Sunshine State Sarah: Justice Scalia: "A lot of stuff that’s stupid is not unconstitutional"
Justice Scalia: "A lot of stuff that’s stupid is not unconstitutional"
For my fellow Federalist Society members and legal scholars, here's a treat: a very long and detailed interview with United States Supreme Court Justice Antonin Scalia in New York Magazine. Scalia is at his intellectually witty best in the interview, covering a wide variety of political, legal, religious, and cultural topics. On originalism as a legal philosophy: "Words have meaning. And their meaning doesn't change. I mean, the notion that the Constitution should simply, by decree of the Court, mean something that it didn't mean when the people voted for it—frankly, you should ask the other side the question! How did they ever get there?" On the limits of declaring laws unconstitutional: "...yes, if a state enacted a law permitting flogging, it is immensely stupid, but it is not unconstitutional. A lot of stuff that’s stupid is not unconstitutional. I gave a talk once where I said they ought to pass out to all federal judges a stamp, and the stamp says—Whack! [Pounds his fist. ]—STUPID BUT ­CONSTITUTIONAL. Whack! [Pounds again.] STUPID BUT ­CONSTITUTIONAL! Whack! ­STUPID BUT ­CONSTITUTIONAL … [Laughs.] And then somebody sent me one." Why he doesn't attend President's State of the Union address: "It's childish...I expect [it's been] fifteen years [since I attended]. But I’m not the only one who didn't go. John Paul Stevens never went, Bill Rehnquist never went during his later years. Because it is a childish spectacle. And we are trucked in just to give some dignity to the occasion. I mean, there are all these punch lines, and one side jumps up—­Hooray! And they all cheer, and then another punch line, and the others stand up, Hooray! It is juvenile! And we have to sit there like bumps on a log. We can clap if somebody says, 'The United States is the greatest country in the world.' Yay! 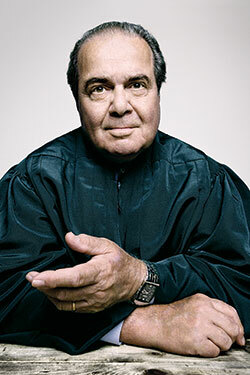 But anything else, we have to look to the chief justice. Gee, is the chief gonna clap? It didn't used to be that bad." A very intriguing discussion of the nature of heaven and hell and related matters of Catholic doctrine on page 3 of the interview. "You’re looking at me as though I’m weird. My God! Are you so out of touch with most of America, most of which believes in the Devil?" He loves hunting and playing poker. Read the whole interview here. It's well worth your time. Welcome to Chicago, Texas! Wait, huh? Hooray for BOTH of my Senators!